To provide a better experience in game, advancing the service standard, and providing more interaction & transaction opportunities to players. 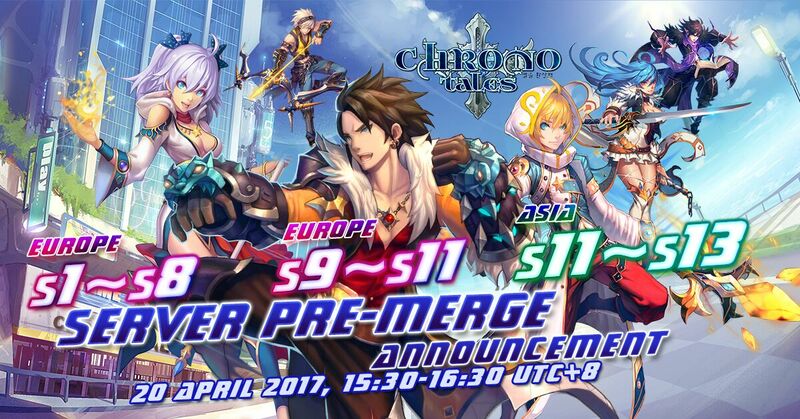 《Chrono Tales》Europe S1-S8 ; S9-S11, Asia S11-S13；will progress server pre-merge on 20th, April, 15:30-16:30 UTC+8. This server merge is divided into 1 group, for the 2 servers’ data interflow. After merging, there’re no changes on login page, players can login the original server to play. In the pre-server merge period, all server’s world lv will be the same with the highest server that in the same group. The data will not interflow. After pre-server merge, will arrange the official server merge in time according to the players’ average lv. 2. Players with same names, the players who register later will be renamed by the system automatically, with receiving one free rename chance. 3. Guilds with same names, the guild that created later will be renamed by the system automatically, with receiving one free guild rename chance. 4. The price in Gold and Silver Market will be reset after calculating via the combination of several servers. 5. After server merging, the character in original server will out from the origin server as well. 6. After formal server merging, system will release a batch of server merge events, please look forward! 上一篇：Pre-server merge notice(ASIA, EU) 下一篇：America New Server S13 Launching! !